Deram Parke site in Coventry, where Barratt achieved a net gain through working with Warwickshire County Council. Our commitment is to seek to create a net gain for biodiversity in design across all new developments where there is no prior planning permission from 2020. We’ve made this commitment in recognition that biodiversity is in decline in the UK, despite its strong environmental protection laws. Given the government’s aim of delivering 300,000 new homes a year by 2020, commercially, a consistent approach to managing biodiversity should help avoid planning delays, and therefore supports this aim. Consistency also improves outcomes for nature and importantly, increases transparency in relation to aspects of the planning process such as offsetting requirements. To improve our management of biodiversity in and around our developments, in 2015 we formed a partnership with RSPB. Kingsbrook in Aylesbury is a good example of the partnership in action. 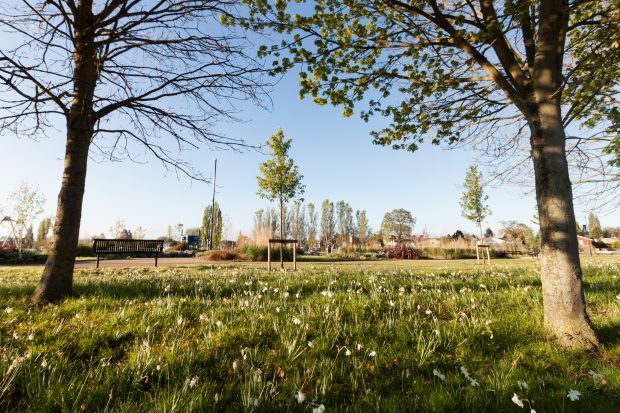 This development has biodiversity aims and objectives integrated into the whole development, which came about through close working between the RSPB, the Barratt team responsible for technical elements of the build and our landscapers and ecologists. The experiences at Kingsbrook led to the production of guidance for the Group. This includes the Growing with Nature Guide, which provides examples of integrating biodiversity throughout developments and the Wildlife Friendly Show Home Garden Guide. This provides simple ideas for making our show home gardens a haven for wildlife and is also available to our new homeowners. Our swift nesting brick project is another example of our partnership working to create a home for nature. We are integrating the innovative Manthorpe Swift Nesting brick into our developments within key cities identified by the RSPB as important for swifts, contributing to swift conservation. This work aligns with our Great Places initiative, which aims to create developments with a strong identity that connect with their surroundings, recognising that providing access to and enjoyment of nature makes up a large part of people’s sense of place and well-being. Through the retrospective assessment of biodiversity net gain (BNG) on six of our sites we identified that applying the mitigation hierarchy, emphasising avoidance as the first step is key to the success of achieving a biodiversity net gain, leading to a reduced requirement for offsets. The challenges are varied but significantly includes the need for more targeted, objective-led data collection by experienced ecological and landscape consultants, working together with the design team through an iterative design process. The process isn’t new, but the net gain objectives are. The language associated with biodiversity metrics and the application of the net gain principles needs to be learned by all parties. The updated National Planning Policy Framework (NPPF) includes a suggestion that local planning authorities (LPAs) should prepare their own policies on how to identify and pursue opportunities for securing measurable net gain. Given the wide variety of experiences and knowledge of BNG approaches and the potential for inconsistencies across LPAs we support the adoption of guidance and standards for BNG. We have funded and input to the development of the CIRIA, CIEEM and IEMA Biodiversity Net Gain Guidelines, since it is vital that the housebuilding industry is part of this process. We are also working with British Standards Institution (BSI) to develop the Biodiversity Net Gain Standards. This will help provide the framework upon which a consistent and level playing field can be created, to support a simple yet flexible and transparent approach. Based on the development and content of these documents, and our experiences undertaking BNG assessments we are working towards meeting our commitment. Defra is currently running a consultation on its proposals to make biodiversity net gain necessary for developments when granting planning permission. To give your views, visit www.gov.uk/government/consultations/biodiversity-net-gain-updating-planning-requirements.